Happiness and exercise may seem like an odd combination of words. Shouldn’t we just be happy or not be happy? During menopause I discovered happiness was going to be an exercise. I had to practice being happy. Being consumed by hourly hot flashes, cranky moods, itchy skin and sleepless from night sweats, being happy was not on my to-do list. It was a full time job just managing these menopause symptoms. Additionally, I had to learn how to eat and exercise differently, and adjust my skin care regime. I was definitely NOT happy about these changes. 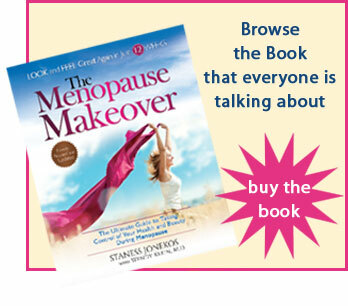 As I developed the Menopause Makeover 8-step, 12-week plan I had to add “happiness” to the menopause checklist. According to NationMaster.com, Americans ranked number 13 on the national scale of happiness, and Canada ranked number 17. Iceland, Sweden and Denmark ranked the top three happiest nations. Hmm, what does that say about women in the United States and Canada? Perhaps, we are too busy taking care of our home, family, finances and career. Maybe the new world of instant communication moves too fast? With emails, the inter-net, and cell phones is there any down time? For the many, happiness is the ultimate goal. 1. Slow down and think about it! 2. Ask yourself what makes me happy, and make a list. 3. Look at your list and ask yourself why are these things missing from my life? 4. Make a commitment to work on the things you can change that have blocked your happiness. 5. Every week take one “happiness item” from your list and set a goal to make it happen. Before you know it, you the things that make you happy will be happening! Just like exercise, you must incorporate it into your life daily! You must exercise your happiness muscle! Finding happiness requires a commitment to change. It isn’t always easy incorporating change into your life, but with practice it will get easier – just like exercise.